You walk into the theater and are confronted with wrought, industrial-looking sets that frame the stage. Performers in elaborate garb survey the audience and casually drop 30 feet, then rebound on a bungee. The air is charged, the stage is filling with fog, and the show is about to begin. 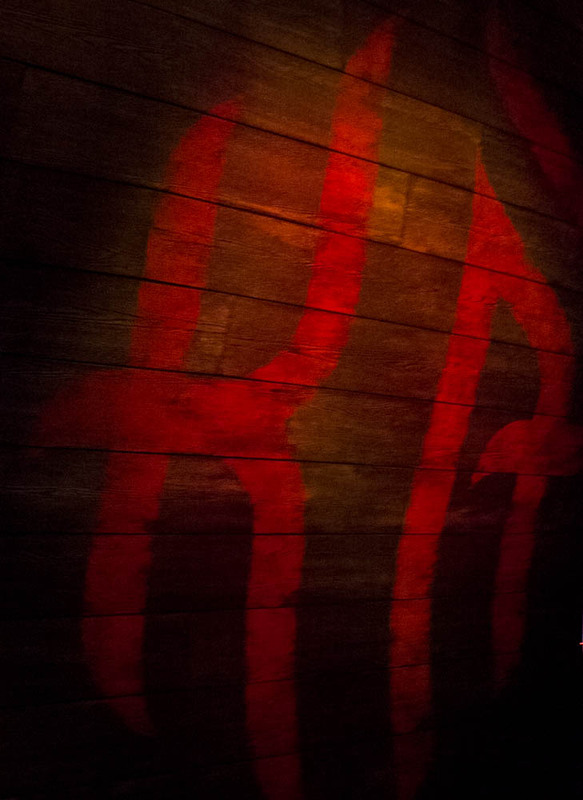 Welcome to “KA” by Cirque du Soleil. For Cirque, this particular show represents a step in a more tangible direction. A clear storyline leads the audience into the depths of the show and both featured characters and peripheral roles are easier to relate to than, say, enormous inflatable snails. A short monologue at the beginning of the show introduces two Imperial twins who, throughout the show, will face trials and tribulations in order to fulfill their shared fate. The stage is itself a study in the unexpected, which is a common theme in Cirque shows. The central platform transforms from a stationary plane to a beach, a battleground and a plunging ship, allowing for an unprecedented dynamism that exemplifies the other-worldliness of “KA.” A hut seen midway through transforms seamlessly into an airborne craft that traverses the space with a soundless, serene soar, and a beach scene is usurped when the platform tips and sends a cascade of sand tumbling down. The show is also not devoid of humor; the seriousness of the Imperial twins’ story is offset by clown-like characters with a European vibe. A couple of mimes in the beginning bumble through a series of shenanigans to remind audience members to silence their cellphones, and one of the most memorable scenes in the show involves a human-sized centipede, crab, starfish and turtle. The twins perform a delightful act of shadow puppetry toward the beginning of the show, deftly manipulating their own and each other’s hands. This swirl of light-heartedness brightens “KA” and keep the overall tone from becoming too serious. The physicality of each of the performers is exemplary. This is combined with the efforts of visionary Robert Lepage, the director of “KA,” and the results are beyond what an average person would even conceive. Martial arts are mixed with hybrids of dance, aerial work and abstract movement that conveys emotion commendably. A pinnacle of impossibility is showcased when the stage, tipped and rotating, is studded with points around which performers can pivot. A battle scene commences, with characters sliding perilously close to the platform’s edges before snagging an outcropping and hurtling in a different direction. “Jaw on floor” is an understatement at that point. A pantheon of aerialists twirling around gargantuan bamboo-like stalks, a lyrical baton act to emotional strings, and fliers zooming around the theater seals the deal with a signature Cirque flourish.The effect is a stunning, pleasantly mind-bending foray into a perfectly three-dimensional alternate world. If this sounds like a world you’re interested in exploring, find more information here. 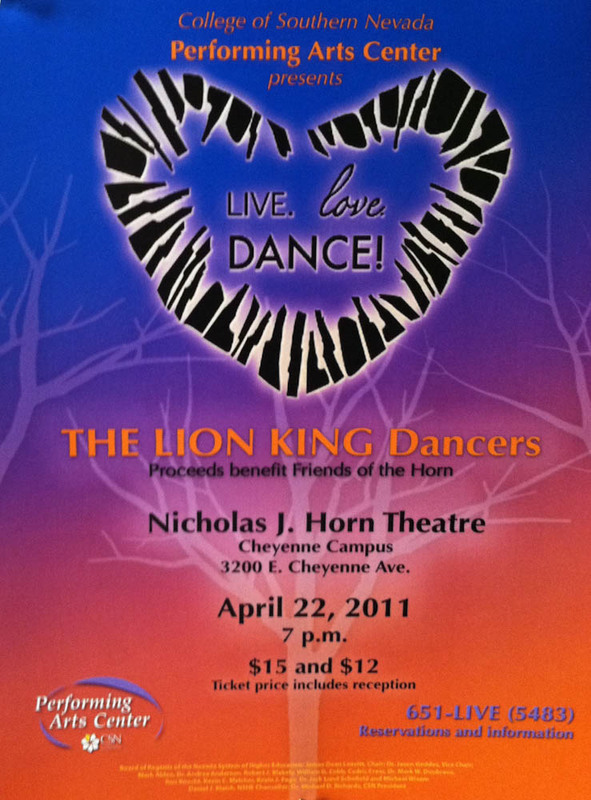 A pride of dancers from Disney’s “The Lion King” will be congregating at the College of Southern Nevada’s Nicholas J. Horn Theatre for a benefit concert of original choreography on April 22. Proceeds from the show will benefit CSN’s performing arts center in an effort to increase artistic diversity and accessibility in the city. “Live. Love. Dance!” will feature choreography in styles ranging from modern to contemporary ballet to funk, Fosse, gospel and jazz, all created and performed by cast members of “The Lion King” at Mandalay Bay. Hicks continued that the cast and creative team is grateful to be partnering with CSN on the project. “The CSN Performing Arts Center is a beautiful facility that brings so much culture to our community, and we are very pleased to support their mission to provide artistic, cultural, educational and entertainment opportunities for the college and the community,” she said. “Live. Love. Dance!” will be performed at 7 p.m. on April 22 at the Horn Theatre on CSN’s Cheyenne campus. Tickets are $15 for adults, $12 for seniors and students, $10 for children under age 12 and for CSN students with valid identification. There’s been plenty of buzz about the now-$70 million musical that has been attracting audiences for failed stunts as well as successful ones. Now, “Spider-Man: Turn Off the Dark” is giving us even more to talk about. The New York times reported that director Julie Taymor will no longer be working with the show (although her name will still appear in the credits), and a new choreographer has been added to the team. (Producers of the show have neither confirmed nor denied whether original choreographer Daniel Ezralow’s contract will be terminated.) Chase Brock has been hired to contribute choreography before the June 14 hard opening. 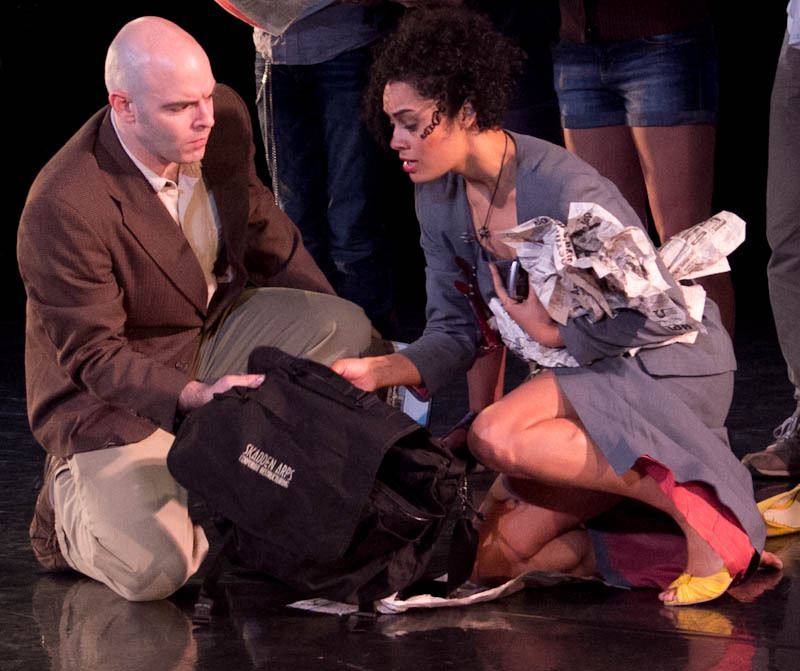 For more information about what’s happening with the musical of accidents and arachnids, check out the articles published on Artsbeat and the Daily Mail. Company members from Nevada Ballet Theatre are stepping into the role of choreography to explore the artistic potential of fairytale worlds. “Beyond Words and Text” is an endeavor into the unexpected and, largely, the unexplored. While “Sleeping Beauty” is a ballet classic, there is hardly a Tchaikovsky version of “The Scarlet Letter.” NBT is changing that, one variation at a time. Artistic director James Canfield introduced the project at the top of the show, saying that the choreographers were given specific parameters within which to operate. 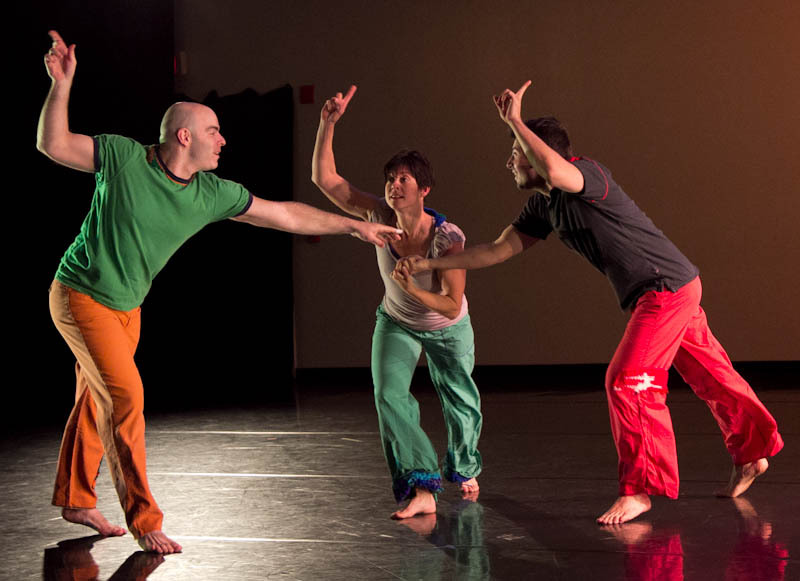 Each chose a fairytale, fable or work of literature to explore through dance and fellow company members performed the variations at NBT’s Summerlin studio. One of the most interesting and enjoyable parts of the show was at the end of each piece, when the choreographer would explain why they chose the story they did and what their artistic objective was. 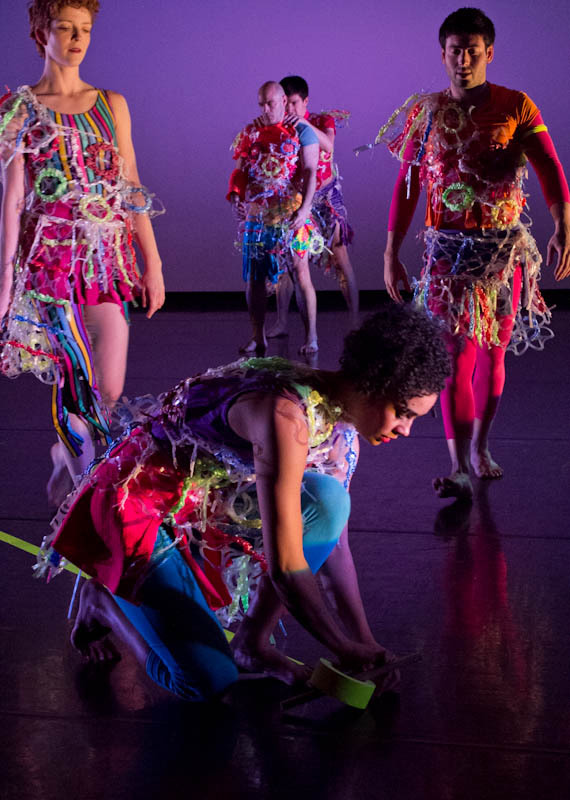 In the performance I saw last week, choreographers Jeremy Bannon-Neches, Kalin Morrow, Sarah Fuhrman, Anthony Paparelli and Barrington Lohr were insightful and verbose and it was obvious that they had researched and examined the ideas behind the pieces they were creating. The results were wonderful. Bannon-Neches drew in literature right away with “Amadeus,” based on the rivalry between composers Antonio Salieri and Wolfgang Amadeus Mozart. The piece was literal but not pandering and the characters established by the dancers were easy to relate to, giving the number the potential to educate without alienating. Fuhrman also adopted an erudite air with an aggressive, intense vignette on “The Scarlet Letter.” The movement was as expansive emotionally as it was physically and added considerable excitement to the tale normally relegated to the dismal realm of “required reading.” Music played a role in this also, shifting from a movie-score feel to Gary Jules’ “Mad World.” Choices like this speckled the show with a contemporary sheen and made classical ballet more accessible to those unfamiliar with it. Morrow, Paparelli and Lohr gravitated in another direction, each choosing a story that most children are familiar with beginning at an early age. “The Jungle Book,” a modern-tainted, earthy feeling variation by Lohr, closed the show with a delicate ferocity that would have given Disney’s “The Lion King” a run for its money. Paparelli ambitiously recreated a scene from “Sleeping Beauty,” reinvented with a panther-like Maleficent and sensual fairies. Seeing classically trained dancers performing such contemporary movement was a welcome treat the performers’ mature presence only added to this. “The Red Balloon” was the subject of Morrow’s choreographic musings. Precise choreography twined around the dancers while a helium-filled balloon bobbed along, the happy companion to a lonely child. Although the original story ends on a light-hearted note, Morrow said she decided to linger on the moment when the balloon is popped and the boy faces the difficulties of growing up. There is bravery in such an ending and the piece certainly benefited from it. “Beyond Words and Text” is running on select days of the week until April 17, with one of two separate programs being performed. (There are nine variations; each show will include four or five of them.) For tickets and additional information, visit NBT’s website here. Nevada Ballet Theatre will be adding to its spring season with two different shows, one on the company’s own Summerlin turf and one at the “Viva ELVIS” theater alongside Cirque du Soleil. “Beyond Words and Text: The Studio Series” is an in-house event that will run for two weeks beginning April 7 and ending April 17. The dancers’ rehearsal studio at the NBT school will be transformed into a black box theater, thus affording patrons an unusual opportunity to see these dancers in a more personal setting. And Princess Aurora from “Sleeping Beauty” won’t be alone in the ballet world for long: The show will feature works inspired by fairytales and fables like “The Jungle Book,” “Three Little Pigs and the Wolf” and “The Velveteen Rabbit,” each selected and interpreted by the choreographer in an effort to correlate music, movement and text. Choreographers Ashleigh Doede, Jeremy Bannon-Neches, Anthony Paparelli, Barrington Lohr, Kalin Morrow, Alissa Dale, Grigori Arakelyan, Sarah Fuhrman and Krista Baker will be presenting their pieces at the times listed at the link below. All performances will take place at the company’s Summerlin facility at 1651 Inner Circle, Las Vegas 89134. Tickets can be purchased for $25 to $45 (excluding convenience fees) by calling (866) 937-9610 or by logging onto nevadaballet.org. Cirque du Soleil will be joining NBT on May 15 and 22 at 1 p.m for the fourth annual “Choreographers’ Showcase: A Project Designed to Stimulate and Encourage Artistic Growth.” The 90-minute show will be performed at Cirque’s “Viva ELVIS” theater at CityCenter’s ARIA resort and will feature five works each by NBT and Cirque. An additional matinee performance is available exclusively for Clark County students and is made possible by ticket sales for the May 15 and 22 productions. An estimated 3,000 students have been included in this program in previous years. Tickets for “A Choreographers’ Showcase” are on sale now and can be purchased for $20 to $40 by calling (702) 531-3800 or by logging onto nevadaballet.org. Purchasing a $40 ticket will guarantee a preferred seat and will afford one student the chance to attend the May 20 performance. All proceeds benefit NBT and are tax-deductable donations.